Open for lunch buffet from Monday through Saturday. Open everyday for dinner. 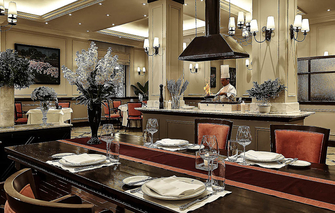 This is the first French restaurant in Vietnam with finest local and imported ingredients. Offers traditional French cuisine in a beautiful setting resembling a turn of the century grand dining room. It offers one of the most extensive wine list in Vietnam with more than 250 references cautiously selected from all around the world. The outlet has been providing guests with quality food impeccable service, and an ambiance full of character for 115 years. Food and breadth of selection is amazing. Service is great. Accor Plus discount not available on beverage packages (nor the food portion) which should have been explained to us at the outset. We were three adults and a child for dinner and all our dishes were superb including the pumpkin soup off the child’s menu. I cannot remember tasting a lobster bisque that good! Empty when we arrived for buffet lunch but filled up with mainly tour groups. Atmosphere OK but ruined a bit by a table playing music on their phone. Good food selection of mostly high quality - steak, lamb and prawns very good - though cheeses were dry and ran out of dessert items. Good vale at 50% discount but high drink prices negate the benefit. We could enjoy Sunday　Brunch. Thank you very much for everyone of a staff. Only one was regrettable. I think there should have been more a lot of kinds of French food. Thank you for your nice feedback about our Sunday Brunch. I'm happy to hear that our restaurant was able to to give you the excellent service. Your comment on the food has been shared with our Executive Chef to review and continue our improvement. Thank you very much for your nice review about your experience at Le Beaulieu restaurant. We are looking forward to welcome you back soon! French onion soup is too big and sweet. Otherwise, cocktails are well made, lamb and veal entrees are very well executed, and the cherry mousse dessert is A+ on both taste and presentation. 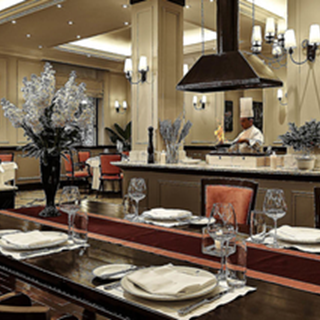 Prices somewhat reflect luxury hotel association, although still reasonable for fine dining. We had the new year's set menu with wine pairing - the food was beautiful and worked very well with the suggested wine pairing. The service was also to a high standard. The decustation meal was pretty average for what we paid for. The pigeon was over cooked and tough. Had little kids running around which spoilt our dinner. This is supposed to be fine dining. Spoiled the atmosphere for New Year Eve. I was there for the Christmas dinner with set menu. The food was pretty good but more international than French. The atmosphere was not very romantic and was a little stilted. Whatever you order is great but don’t miss out on the lobster bisque. One portion is sufficient as starter for two. No doubt, the best French restaurant in Hanoi, which will make the tourist's impression of Hanoi much better. The mushroom dish was bland. The bone-in Rib Steak was excellent. Everything was perfect. However I was quite surprised that there were children running around the restaurant. Beautiful restaurant in a stunning a hotel. Fantastic service and food was excellent. Ice -cold AC was unnecessary and made us leave as soon as we finished. Service was VERY slow and we had to ask for everything we needed (eg. no one asked us if we would like more water and we ordered a drink partway through the meal which never showed... we weren’t charged for it but it was still frustrating having no water or beverage at all for half the meal ). Out of the two of us one appy was overcooked and one entree was VERY overcooked. We were accommodated by them removing the entree from the bill but for the price paid and the reputation we were not expecting such a poor experience. We had a wonderful dinner and the Hotel is perfect, Pre dinner drinks were excellent but the Dinning room was a little sparse and cold however, the service more than made up for this. Food is very good. Really like their lobster bisque. Also, service from our waiter and the executive chef is excellent. Delicious food and attentive service in a beautiful restaurant!